Our proposal is developed out of the functional requirements of future museum complexes and the integration of various innovative solutions for a modern information center in which the application of environmental building systems as well as optimized construction concepts are found. 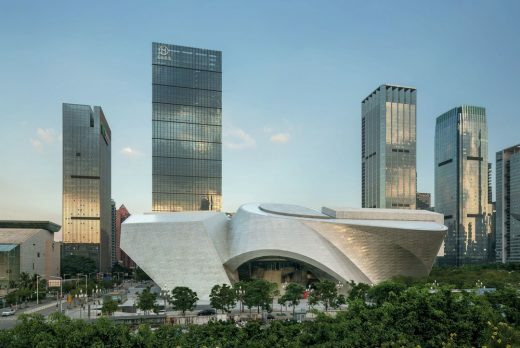 It is an urban meeting point and serves as a dynamic element in the progressive system of the city of Shenzhen in the middle of their new center, the Futian Cultural Center. The building integrates itself in the language of the established master plan and represents the discovery of an individual exciting object. The Museum of Contemporary Art & the Planning Exhibition (MOCA and PE) are conceptualized as a unified whole but are nevertheless articulated in an unique way: The various pieces are optimally positioned in the structure according to their function, meaning and requirements. The creation of the refined museum experience results in the formation of various public and semi-public areas. The form of the building is a result of a vertical extrusion and rotation from the rectangular ground floor through to the roof level. A new entry orientation has been achieved through this rotation to the axial center of the cultural zone of the Futian Central District and to the main circulatory flows. The resulting rotation generates a dynamic building in the form of an active wave. By using black anodized metal and black glass, the active wave is frozen into an urban monolith. A large bridge is connecting the building to the Youth Activity Hall (YAH) and sealing off the east wing of the master plan. In our proposal for the YAH building the original geometry is both respected and simplified to give a clarified reading of the overall volumes. Through the main entrance the visitor enters the light filled Entry Hall that is a generous urban multifunctional plaza. Several functions like cafés, bars, bookstores, museum shops, sculpture garden, and museum event spaces can be incorporated into this zone. This generous public level serves as a key turning point and orientation center, where multiple entries and exits are possible. Deformations on the underside of the body of the museum, above the entry hall, contain the Shared Spaces. The central lobby double cone vertically penetrates the entire building serving to bring natural light into all levels. From here the visitors begin their journey with two possibilities: the first being through the double cone into the museums (MOCA in the basement and PE in the upper levels), the second being a promenading sweeping spiral that circles around the double cone leading into the Shared Spaces and connecting bridge to the YAH. Both exhibition levels MOCA and PE consist of generous floor space and allow for flexible and multifunctional usage. The double cone serves as a fast connection between both spaces and provides an exciting transition with urban views. In MOCA the double cone offers, in addition to the exhibition loop, direct and independent entry and exit space to the individual museum spaces. Daylight arrives via long lateral light gaps as well as from direct overhead openings. The upper level of the PE is composed of an independent truss system and housed in this level are all of the offices along with adjacent Green Zones and HVAC/Mechanical spaces. The remaining volume of this roof structure serves as a filter for daylight, louvers, a rain retention system as well as recovery of solar energy. The overview of the roof grid from the existing adjacent skyscrapers resembles an animated checker board. The exhibition spaces with their necessarily tightly controlled environments are physically separated from the loosely controlled macroclimate of the circulation and lobby spaces, so that these act climatically as a buffer zone between the external climate and the microclimates in the exhibition spaces, in which constant temperatures and in particular constant humidity levels are necessary to protect the exhibits, which are in most cases of hygroscopic nature and thus prone to damage on account of changing levels in relative humidity. The multifunctional Grid-Roof serves a variety of technical functions; daylighting for the Planning Exhibition space, garden space (green planting to improve building microclimate), rainwater collection, roof structure with sufficient height to avoid the need for columns in the space, technical plantrooms, thermal collectors for the production of warm water, photovoltaic cells for electricity generation and a ceiling zone for services distribution and artificial lighting. A significant proportion of the required lighting level in the exhibition spaces can be provided by daylight. The Planning Exhibition space is daylit using openings in the Grid-Roof, which allow controlled daylight into the space, whereas the Museum of Contemporary Art space is daylit via the Light Gap. The exhibition spaces are conditioned by an all-air VAV-system (no water systems in the exhibition spaces). People are a major contributor to the room cooling load and also determine the amount of fresh air to be provided, so that the load dependant reductions in supply volume possible with a variable volume system provide a large energy saving potential. Supply air is ducted from air handling units located in the vicinity of the exhibition spaces and delivered via floor displacement grilles into the spaces. Return air flows via the light fittings from the exhibition spaces into the suspended ceiling zone thus removing a large proportion of the heat from the lighting before it becomes a load on the space. Combined heat and power generators fueled by natural gas or possibly biomass provide the building with both heat and electrical power. This solution has both ecological and economic advantages compared to more conventional alternatives (c. 60% less CO2 emissions) but also provides a major advantage with regard to security of supply which for the intended building use is not to be underestimated. The heat is used to drive an absorption chiller which supplies chilled water to cool the supply air in the central air handling plants. An integrated security system is provided including CCTV (close circuit television) surveillance of public areas, full function access control at selected entrances and lifts and central monitoring equipment within a main lobby security/ reception desk. A complete Building Management System (BMS) is provided consisting of multiple Direct Digital Control (DDC) data processing outstations and a central management system. The building complex is assembled of the cut museum cuboid, the steel cone, and the massive base. The structure of the PE-Museum body consists of a spatial triple-layered framework, based on four differently shaped cores and one column of reinforced concrete. Additionally the structure is supported by the steel structure of the cone. The three layered spatial framework – Sandwich Structure – allows large cantilevering building components. Compared to a single layered structure, the advantages are a higher static level and the integration of the upper and lower floors in one structure. Only where needed, the upper and lower framework layers are connected through the middle framework. To allow maximum spatial latitude the compound axes are reduced to the very requirements of the structural load-allocation towards the distributing and load-carrying elements (cores). The lower framework layer has an elevation of 2.50 and a field width of 4.40 meters. The internal construction height of the museum space is about 9.50 meters; the elevation of the upper framework is 5.00 by a field width of 8.80 meters). The horizontal forces are carried into the reinforced concrete walls of the cores. Due to the oblique shape of the cores the loads are easily led into the foundations.